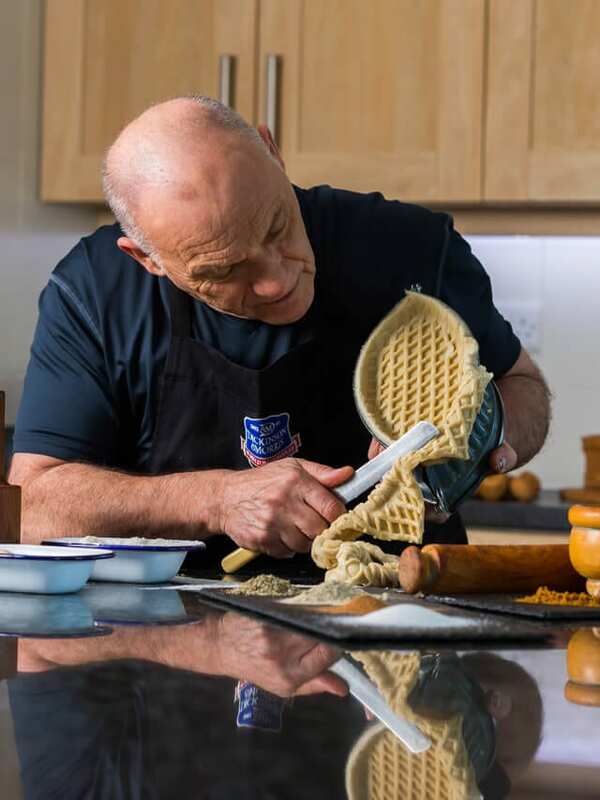 A message from Sir David Samworth, some three decades ago, has stood Master Pie Maker Ian in grand stead through a sparkling career, which has seen him redevelop the Melton Mowbray Pork Pie, produce the iconic pie for the Royal Family and, with his team, win a catalogue of awards culminating in a record 48 prizes at the 2016 British Pie Awards. When Sir David purchased Ye Olde Pork Pie Shoppe in Melton Mowbray Ian and his colleagues were asked to renew the Melton pork pie. The task took many painstaking months of weekly taste panels on a Friday afternoon, making tweak after tweak with the recipe. Ian took inspiration for the product from The Selfridges New Model Cookery Book, published in 1929, which advised using certain cuts of diced pork as opposed to minced. Eventually, the Gold Standard of pork pies was launched in 1992! To maintain the richness of the pastry it is baked in a fluted unique hoop and the chicken is marinated in a host of seasonings to give it succulence.